It was a busy day for me last Saturday when I first noticed the Occupy Anchorage folks in Town Square, so I didn’t get a chance to speak to them. It had been a small gathering to be sure (just a few dozen that I saw in the early hours of the day, clearly I missed the peak moments portrayed in other reports), but there they were. The next day, the occupy site was still set up and running with a skeleton crew, and I was curious enough to come when I had some time to chat. So, I wandered over to the two protesters still in the park at about 8:00pm on Sunday night. This time I found 2 demonstrators amidst a smattering of signs, a collection of books, a coffee dispenser, and some literature. It took me a minute or two to figure out that a couple other young men hanging about the vicinity were not part of the demonstration. The two demonstrators included a young man of about college age who had joined the movement after recently moving up from Portland. The second, a middle-aged man who worked at a local hotel, held a sign saying; “I want a government that’s not for sale.” He thought surely he remembered me from his work, but that seemed more than a little unlikely as this was my first visit to Anchorage. We were still shrugging and chuckling about this little bit of confusion when a woman strode up to ask him if he understood what the words to his sign truly meant. Receiving nothing but blank stares in response to her initial query, the woman repeated herself, and then answered her own question. She explained that the trouble was that lobbyists held too much sway over lawmakers. The sign, in her estimation, didn’t make that point clearly enough. She also let the two protesters know in no uncertain terms that she felt the movement had failed to make that point clear, a fact which seriously undermined the effectiveness of the Occupy movement. For my own part, I rather thought the sign conveyed that point about as precisely as any political slogan on a stick ever had, and I couldn’t help wondering if the sign had been the real cause of her concerns. Had she voicing a concern that had arisen some time before, perhaps while watching the news coverage of some other Occupy protest? I really didn’t know. In the next hour or so, I learned that the folks at Occupy Anchorage have been demonstrating in Town Square on Saturdays for about a month. Last Sunday was their first attempt to keep the occupation going 24/7. The movement to occupy Anchorage had begun on Facebook, so the demonstrators told me. Additional occupations have been made in Fairbanks, and apparently the Anchorage group has staged a number of related protests in the area. As I chatted with the demonstrators a number of passing cars honked in apparent support. A lovely couple on their way to the theater nearby said; “thanks for being out here.” (Odd that I remember the statement as coming from the couple; I cannot for the life of me remember which one said it). One man in bare feet donated several dollars to the cause, and a couple people stopped by to get a free cup of coffee from the protesters. Of course the folks at Occupy Anchorage had received some negative feedback as well. In the day and a half since he had been in the square, the younger man had heard more than a few “Get a jobs” and a pair of ROTC guys had apparently decided he was a Communist. Which brings to mind the ongoing flow of dialogue one finds on the net? Today I am scanning the webpage of the 53 Per Centers, and it is filled with people touting the benefits of a life of hard work, and condemnations for those who want free handouts. The absence of any genuine clash with the Occupy movement is quite striking. In fact, many of the 53% have called attention to problems similar to those raised by have raised concerns similar to those of the Occupy movement. A couple notes how hard they are working to pay off their loans. Another woman mentions how much more money her husband could make in working for a corporation as opposed to running their own business. Someone else mentions the need to eat “dirt sandwiches” in order to get ahead in life. Others report more success, all due to hard work and perseverance. To be sure, there is something moving about the messages of the 53%. Whatever else these are, they the testimonies of lives well lived, of hard work, and in some cases of rewards well earned. These are stories that should earn people respect, but there is something more than a little disconcerting about the complete lack of engagement with the actual claims of the Occupiers to which these stories are supposed to be a response. To read the 53%, the Occupy Movement is essentially a press for increased welfare benefits. At least in Anchorage last Sunday, I found absolutely no demands for freebies or government hand-outs in the signs or the literature they handed out. I imagine one or two of the books in the stall may well have argued for such programs, but that would pale in comparison to the many other agendas contained in the small library. What were the specific interests at stake in this protest? Concerns over the Glass-Steagall Act came out, as did disappointment over the Tea Party movement, opposition to bank bailouts, and the legal classification of corporations as people. No surprisingly, the Koch brothers made an appearance in the list of villains to be vanquished. If there was an overriding theme in Anchorage last Sunday it was the need to get business out of government policy-making. 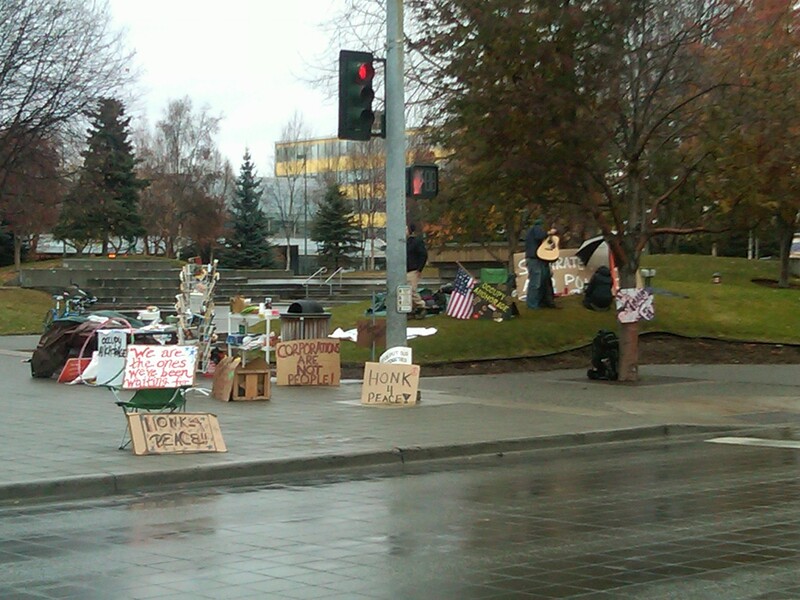 In short, the folks at Occupy Anchorage simply were not asking for hand-outs at all. They were complaining about the way business has been conducted in America, and the way it has impacted government. Was this unusual? I don’t think so. The Occupy movement has raised a similar number of complaints all over the country. Glass-Steagall, Campaign Finance, Corporate Welfare, and the Citizens United case have been all over Wall Street. Can you find an appeal for greater welfare programs in the mix of issues its proponents have raised? These are simply not demands for hand-outs; they are demands for fair play. I don’t know if the Wall Street protests will lead to anything good, and I certainly don’t know how the local version of the Occupy movement will fare in the coming Alaska winter. Still I can’t help but think some of these folks are complaining about the right things. It would be a shame if that message really was lost in a maze of disinformation. Lots and lots of red-baiting on certain news channels if you know what I mean. The whole dirty commie hippie argument is getting old. Sadly, the red baiting has been quite effective, hasn’t it?